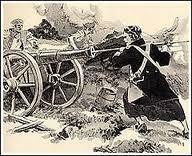 Anna Maria Lane is best known as Virginia’s only female soldier in the Revolutionary War. 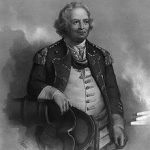 Anna Maria followed her husband, when he joined the Continental Army in 1776. Although many women worked as cooks or laundresses at the military camps, Anna Maria dressed in men’s clothing and performed the duties of a soldier. John and Anna Maria fought in battles in New Jersey, Pennsylvania and Georgia. The Lanes were with New England troops under General Israel Putnam when he linked up with General George Washington‘s army near Philadelphia after the Battle of Brandywine. At the Battle of Germantown, Pennsylvania, on October 4, 1777, Anna Maria received a leg wound that left her lame for life. She was probably not with her husband when he was wounded at Savannah, Georgia. After the Revolutionary War, pension records were issued to persons who gave military service, not only for soldiers. A woman who served in a quasi-military role that was recognized by the Army – such as a cook, a laundress or a nurse – could receive a pension. After the war, John Lane worked at the state arsenal at Point of Fork in Fluvanna County, Virginia. In 1801 he and Maria couple moved to Richmond, where John joined the Public Guard. The Lanes and their three children received daily military rations. 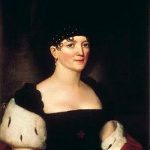 Anna Maria worked as a nurse in the military hospital, where she made the acquaintance of Dr. John H. Foushee, at whose request Governor James Monroe and the Council of State authorized her to be paid a small stipend for her work. Four years later, John Lane and several other men were discharged from the Public Guard, and Governor William H. Cabell requested the General Assembly to provide pensions for those disabled male soldiers as well as for several women. In 1808, eight people were awarded pensions by the Virginia General Assembly. John Lane and the other pensioners received £40 a year, which was the standard for the Virginia state pensions. However, Anna Maria Lane’s pension record states: “In the Revolutionary War, in the garb, and with the courage of a soldier, [she] performed extraordinary military services and received a severe wound at the Battle of Germantown.” Therefore, she received £100 per year. Anna Maria Lane died on June 13, 1810.